In the previous installment of this column, I presented A Pickup Primer to introduce some of the most important factors and variables in the construction of any pickup. This more detailed under-the-hood examination follows on from that, so if you haven’t read it already it’s probably worth checking out the first piece to get the basics on board before proceeding, or at least circling back to put it all together. Any given pickup, whether of the same type or an entirely different design, is the product of a handful of major variables, and will sound different depending on how any individual ingredient, or a combination of several, is varied in the recipe. I will cover these in detail in three main chunks: The Makeup of the Coil, Magnet Type, and Impedance and Inductance. The first follows here; the other two will roll out shortly. Coil Size: Is More Wire Better? 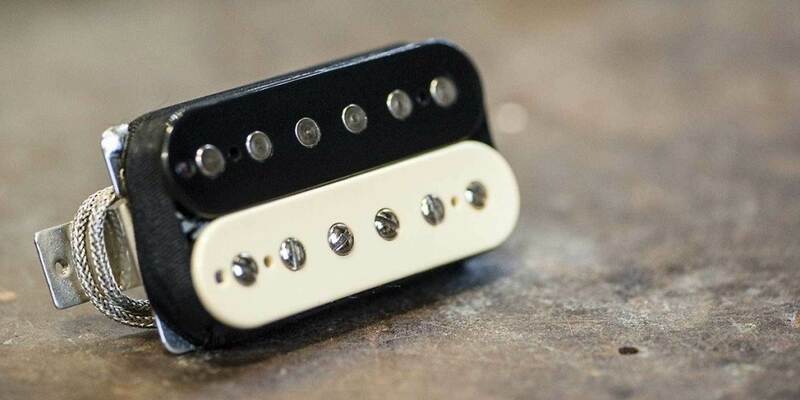 The most obvious factor in the makeup of any pickup coil is the number of turns of wire that are wound around it, which is to say, the length of the wire used, which goes toward determining the overall strength of the pickup. All else being equal (and we’ll need to use that phrase a lot in discussing such variables), the more wire you have in any given type of pickup, the bigger the signal it will produce when you strum the strings, and the more powerful it will sound. More wire doesn’t just mean a more powerful pickup to drive the amp harder, though, it also brings a change to the pickup’s frequency spectrum, and players who feel they want a “hotter” pickup might not also want that sonic alteration that comes with it. Adding more wire to a coil increases midrange response but attenuates treble and bass; the reverse applies for removing turns of wire from a nominal, tonally acceptable “standard” number of turns in any given design. Up to a point, increasing a pickup’s midrange aggression by adding more wire can work to the advantage of a weak pickup with a harsh, brittle treble response, as the high strings will sound smoother and fuller with an increase in output coupled to a decrease in pure highs. Coupled to this, however, the wound strings—which perhaps sounded just right as they were—will round out too, possibly becoming muddy or flabby or indistinct sounding if the increase in winds is taken to extremes. The main thing to consider here, perhaps, is that you usually can’t have it both ways: if you love the sound of a vintage-style lower-wind pickup but also want a hot pickup to drive your amp harder, chances are you’ll have to compromise a little somewhere. These are all relative and “just for example,” but you get the idea: any change in spec will often alter different performance factors. The amount of wire is far from the only factor to consider here. The type of wire and the way it is wound into a coil are also of huge significance. Pickup makers use different gauges of wire to achieve different ends, although 42-gauge is the most common. If you start winding a typical Stratocaster pickup and keep going until it’s full, you might, just for example, get to 8,000 turns of 42-gauge wire before you run out of room. If you want even more than that for a “hotter” pickup, you need to use thinner 43-gauge wire instead, which lets you increase the length of wire and to wind it on more tightly too. Alternatively, if you’re designing a pickup from the ground up and space is too tight to allow enough 42-gauge wire for an acceptable output, you might use 43- or 44-gauge instead, just to get enough signal out of it without necessarily trying to make it “hotter”. Higher gauges were used in many old DeArmond pickups for just this reason, while several high-output pickups also use it to achieve their desired ends, and Fender’s petite Telecaster neck pickup has traditionally used 43-gauge wire to get enough output from the design, which is notably smaller than a Telecaster bridge pickup or a Strat pickup. The thing is, this change in wire gauge doesn’t just allow you to pack on more wire; it introduces a change in sound, too. This change is likely to affect the balance of highs, mids and lows, the pickup’s relatively clarity or snarl, and other factors. Exactly how it affects these depends on other aspects of the design and how the coil is constructed, but be aware it will make a difference. Note, for one example, that Fender’s very early 1950 Broadcaster bridge pickup used 43-gauge wire and had a bright, fat, somewhat gnarly-edged bite to it, whereas standard Telecaster bridge pickups that followed were otherwise largely similar in construction but used 42-gauge wire, and had a somewhat clearer, tighter, yet still meaty flavor of twang. All pickup coil wire is insulated, otherwise the coil would be one massive short-circuit within itself. So why should the type of insulation matter? It’s just the stuff that coats the wire, and the wire’s what generates the signal. But every minute variable in the way a pickup is made can have an (often surprising) affect on how it creates a signal, so it’s conceivable that different insulation materials might introduce different characteristics to the coil. The most commonly used insulating coatings are Formvar, plain enamel, and polyurethane, and each results in a slightly different thickness of insulation, and different degrees of relative stiffness or flexibility in the wire, too. Formvar-coated wire was used in Fender Stratocaster pickups until about 1964, when the company changed to plain enamel, and this slightly thicker, heavier Formvar therefore is the coating material you will hear bragged about most in the literature of contemporary winders keen to point out how rigidly they adhere to vintage Fender Strat specs. 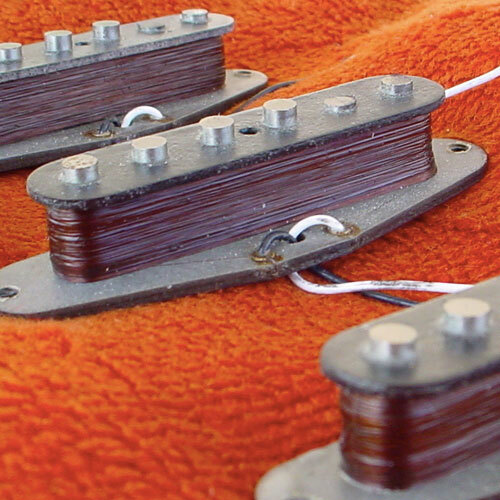 Gibson, on the other hand, used plain enamel-coated wire for both its P-90 single coils and PAF humbucking pickups, while Fender was always using plain enamel for its Telecaster pickups, so this type of wire has come to be an essential ingredient of any repro PAF or vintage-style Tele pickup. On one hand, many great pickup makers will tell you “wire is wire.” On the other, many will also expound at length on the fact that insulation will both vary in thickness according to the material it is made from, and will affect the inductance and capacitance of the coil according to that thickness. Arguably, the insulating material also affects mechanical vibration, and therefore resonance within the pickup, according to how hard/brittle or absorbent it is. In these ways a change in insulation coating material can indeed change the sound of the pickup in a very real way. As for what is better or worse, that will depend on the overall design of the pickup, and the tone you seek to achieve, so it’s best to read makers’ specs and descriptions regarding their individual designs, and to trust the best pickup winders to use materials that they feel are right for the job. By this, I mean the even- or unevenness, tightness or looseness, regularity or irregularity with which the wire is wound onto a pickup’s bobbin or coil former. All of these factors are introduced into the pickup’s construction by the winding technique, which is often influenced by whether the coil is wound on an automated machine (and what type of machine), on a machine with the wire hand-guided onto the coil as it builds up, or with even more hand work (few pickups are truly “hand wound,” however, which is no surprise when you consider how much time it would take to turn a coil by hand 8,000 to 10,000 times to get all the wire on there! Instead, the hand element usually involves how the wire is fed or guided onto the coil as it spins on some motorized device). Many pickups today are wound in an effort to replicate the “happy accidents” found in the randomness or irregularity of the best sounding vintage pickups. Aficionados often attribute some of the magic of good vintage-style reproduction pickups to a degree of looseness in the wind, which translates to a slightly microphonic pickup. By “looseness” we’re not talking to the extent that wire is flopping around and the coil is changing shape, or producing excessive feedback howl even at moderate volumes. But a touch of microphony can contribute to a lively sounding pickup, and when a coil is acting both as a microphone that pickups up direct guitar-body resonance in addition to its electromagnetic sensing of string vibration, it’s conceivable that it is producing a richer, more complex signal. Similar to this, the neatness and consistency with which the turns of wire are laid into the coil, or layered, is also responsible for certain sonic properties. The term “scatter wound” describes a coil that has been wound with a degree of calculated randomness, if you will. Manufacturers that employ this technique cite the arguably sloppy winding of some vintage pickups, where wire was not layered up wrap upon wrap, precisely, as it formed around the bobbin, but occasionally made skips and jumps up and down the coil’s vertical plane. Coils might also be built up unevenly, with the wire stacked more widely or heavily toward the bottom or the center. Sloppy or not, scatter winding is also accredited with a liveliness of tone, and many modern manufacturers seek to reproduce it. Others, of course, will boast of the superior precision and regularity of their turns, and credit this with superior sounding pickups. A more tightly, evenly wound pickup is often considered smoother and clearer sounding, less prone to feedback, and might genuinely be the preferred choice for players seeking singing contemporary high-gain lead tones, for example. 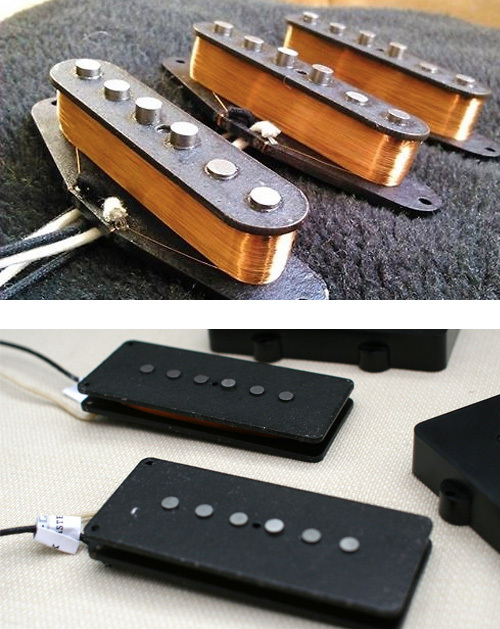 In humbuckers, the effects of coil winding are compounded, since two coils will interact to produce a signal. In recent years, for example, many makers have discovered that one of the keys to creating an accurate-sounding reproduction of the hallowed Gibson PAF is to combine coils with different numbers of winds—one with 3,800 turns of wire, for example, with another of 4,300 turns. Since these mismatched coils result in slightly less phase cancelation when their signals are combined, they are attributed with enhancing the bite, edge, and high-end complexity of the pickup, and lending a certain single-coil-like depth to the midrange and a clarity to the lows. Less phase cancellation also means a little less hum cancellation, however, so evenly matched coils excel in noise rejection, while also being more smooth and even sounding, where that might be desirable. 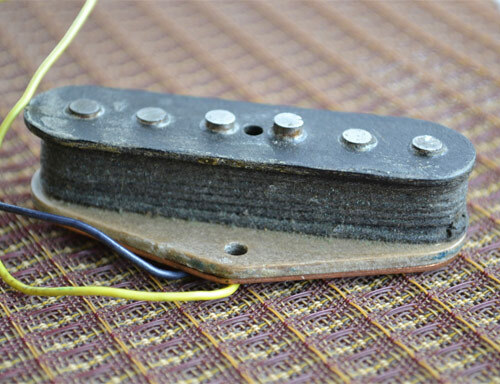 Many pickups are “potted” (dipped in melted wax or paraffin) to provide an overall dampening insulation within the coil windings to quell unwanted vibration and microphony, which can lead to feedback squeal at high volumes. Akin to what is discussed above, an un-potted pickup’s microphony can be another vintage-associated characteristic, enhancing bite, edge, complexity and harmonic content. For smoother overdrive and less squeal at high volumes, though, potting is usually desirable. While potting is essential for some pickups intended for certain playing styles, others will benefit from being left unpotted. Finally, the basic physical shape of the coil will also influence how it sounds. 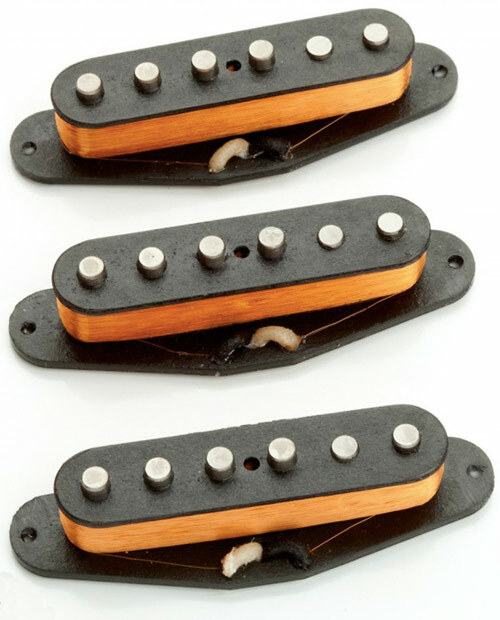 Whether the same type and amount of coil wire is stacked up in a tall, narrow, vertical oval like a Stratocaster pickup (which tends to sound brighter and more focused) or a wider, fatter, more horizontally inclined oval like a P-90 (which tends to sound thicker and warmer), this shape can make a big difference in the final tone. As we know from Pt I, however, Strat pickups and P-90s have differences other than mere coil shape, so let’s compare two designs that are closer to being alike in all other ways. Consider Fender’s Jazzmaster and Stratocaster pickups: both have six alnico rod-magnet pole pieces and are held together by fiber top and bottom plates. Now wind the same amount of wire around both configurations and you will get pickups with similar output levels, but significantly different sonic signatures: the narrow, tall Strat pickup will be tighter and brighter; the wide, thin Jazzmaster pickup warmer and thicker. A big part of this goes back to the basics of the electromagnetic device. Building this structure around a different framework, and thereby rendering the ultimate shape of the device differently, also changes the structure of the magnetic field and leads to pickups that read string vibration slightly differently, while differently shaped coils also simply behave differently, even when loaded with the same type and amount of wire, because the wire is spread along a different geometrical pattern. The wider pickup shape contributes to a wider magnetic window, which samples vibrations from a wider region along the length of the strings. A longer sample of the vibrating strings means more competing frequencies which, when blended, lead to a little phase cancellation and, therefore, a slightly warmer, less defined, less brightly focused sound. I’m talking extremes here, and of course a single coil vintage Jazzmaster pickup is still a pretty bright and focused sounding pickup. But it does sound different from a narrower pickup made with exactly the same ingredients. In Pt III—coming soon—we’ll take the deep dive into different types of magnets, then in Pt IV we’ll explore the relevance of specifications like impedance and inductance. Dave digs into magnets in the third part of our ongoing exploration of the mechanics of guitar pickups.